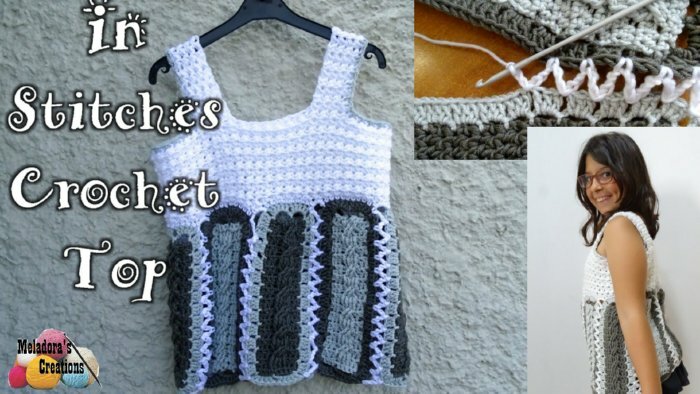 This free crochet pattern comes with pictures and a video tutorial to take you step by step on how to make this crochet top. My daughter has asked me to make her something and this is what I came up with. 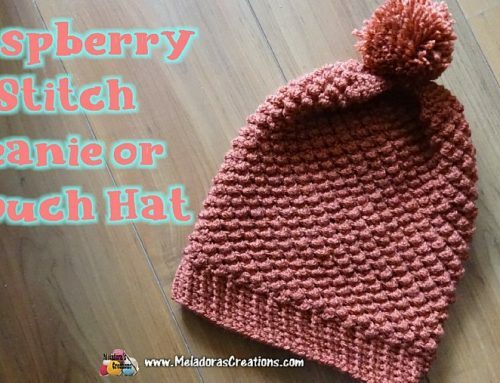 This pattern is very user friendly and can be made in any size by adding more straps or thickness to the straps to make the pattern bigger in general. 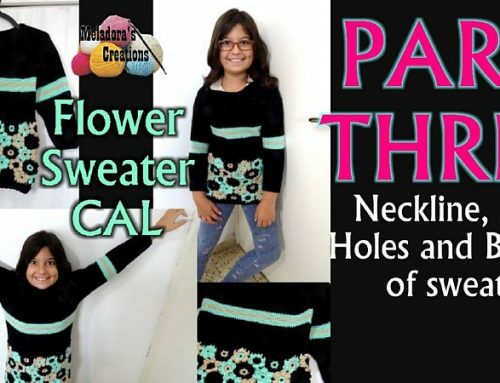 Here’s a fun video showing you more pictures from this pattern. Each skein is 100 grams, Anti pilling Acrylic Yarn. I got one skein of each of the three colors I used on this project. This is size small and was made for a 10 year old girl. First use this pattern and tutorial to make your strips. I did 13 to 14 sections with mine, but you can make them as long as you want. Feel free to make as many straps as it takes to make the size you need. HERE IS TUTORIAL FOR STRAP https://goo.gl/KAvBQF But wait, before you go! There’s a few things you need to know. On measuring my straps, one of the yarns I was using seemed thicker, so I measured my straps side by side and would stop when they were even in length, even if I was one row shorter. That’s because it’s okay. The way we sew them together allows for mistakes. Oh I need to mention, I only did one Border Row instead of the 3 rows of border the pattern called for. Welcome back! Now’s I’ll be showing you how to attach those straps together. This pattern can be adjusted in size, but in this pattern and tutorial I am showing you child size. My daughter who I am making this for is 10 years old. I recommend that you always leave a tail when creating a new loop, so you can hide it later. Also when you cut your yarn, leave a long enough tail to be hidden later with a tapestry needle. This will give you a cleaner look for your finished piece. Connect your yarn by slip stitching on the ch 1 space just after a corner. Then ch 3.
sl st to connect it to it’s equal stitch, but on the other strap. Ch 3 and now go back and forth slip stitching and chaining 3 using the ch 1 spaces of each strap. It should even up at the top ending in the same holes that you began with, if you’re off by one then you can skip a hole and finish. and it requires 2 stitches to create. The Glover stitch is done in rows so we will be turning our work after every round. Insert your hook into the FLO of the next stitch, pull up a loop (2 loops on hook ) YO and insert your hook into next stitch and pull up a loop ( 4 loops on hook ) YO and pull through all 4 loops and ch 1. Don’t forget the ch 1 at the end, it’s very important. Continue all the way around doing the Glover stitch until you reach the end of your row. Don’t ch 1 after the last Glover stitch of your row, sl st into the beginning st. The sl st counts as your ch. Ch 1 and turn. Working with the first stitch you’re in, Insert your hook into the FLO of the stitch, pull up a loop (2 loops on hook ) YO and insert your hook into next stitch and pull up a loop ( 4 loops on hook ) YO and pull through all 4 loops and ch 1. Repeat for the row. At the end of row 3 you will notice that you have one stitch left, to do the very last Glover stitch of your row, you begin the stitch in the last stitch, then finish the Glover stitch using the same stitch where we began our next row. Then remember to not ch 1 but to sl st in beginning st. Ch 1 and turn. Repeat row 3 for 10 more rows for a total of 13 rows. Go more if you want your top to be longer. Cut your yarn and now we need to measure for our straps. Lay your piece down where there is a Glover Stitch facing a Glover stitch on the sides. 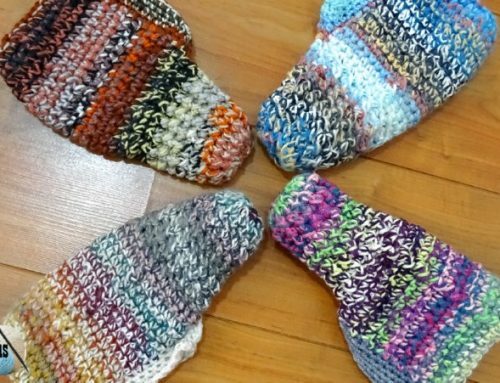 In other words, don’t have just one Glover stitch folded over, but have 2 stitches facing one another. It’s important to have even stitching. Then count over 5 Glover stitches (or 10 sts) and place a marker. Then count over 4 Glover stitches and place another marker. Then do the same for the other side of top. Repeat instructions to mark the other side. 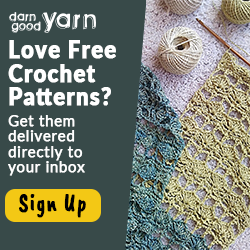 Connect yarn where your first st marker is. Work your 4 Glover stitches , Ch 2 after the last Glover stitch of the row and turn your work. Begin your first Glover stitch of this row using the second ch from the hook and finish the stitch as usual using the next stitch. I did 18 rows total for the strap. Sl st to attach to the other side of the top where your stitch marker is to create the strap. Be sure to have the back of the piece outwards facing you so that the sewing won’t show. Repeat for other strap. I added a row of Glover stitches around the hole for the arms. To do this, make sure the front of your work is facing you. The front side, the side you want people to see. Attach your new color anywhere on the side. We will be crocheting the Glover stitch for the border. 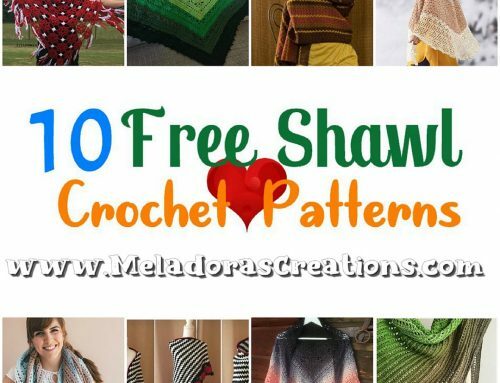 Keep in mind the straps themselves you will be crocheting on the side stitches of the Glover stitch. Just find a st to work on, keep your distance between stitches consistent. Work your way around until you reach the first Glover stitch of the round, don’t ch 1 after the last Glover stitch of your row, just sl st into the beginning st.